The security system alarm activates when the trunk, hood, or doors are opened without the key, or remote transmitter, or keyless access system. The horn sounds intermittently and all of the exterior lights flash. Unlock the vehicle using the key, remote transmitter or keyless access remote. The system, along with the horn and flashing lights, is deactivated. The security system alarm automatically sets when the following conditions have been met: • The power mode is set to VEHICLE OFF (LOCK). • The hood and trunk are closed. • All doors are locked from outside with the key, remote transmitter or keyless access system. The security system indicator in the instrument panel blinks. When the blinking interval changes after about 15 seconds, the security system is set. The security system is canceled when the vehicle is unlocked using the key or remote transmitter, or you grab either front door* or any door* handle while carrying the keyless access remote, or the power mode is set to ON. The security system indicator goes off at the same time. Do not set the security system alarm when someone is in the vehicle or a window is open. 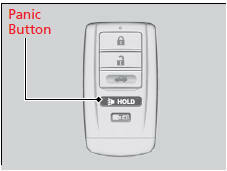 The system can accidentally activate when: • Unlocking the door with the lock tab or the master door lock switch. • Opening the trunk with the trunk release button on the driver’s door or the emergency trunk opener. If this occurs, deactivate the security system alarm by unlocking a door using the key, remote transmitter, or keyless access system. Do not attempt to alter this system or add another device to it. If you press the panic button for approximately one second, the following will occur for about 30 seconds: • The horn sounds. • Some exterior lights flash. Press any button on the remote transmitter, or set the power mode to ON.